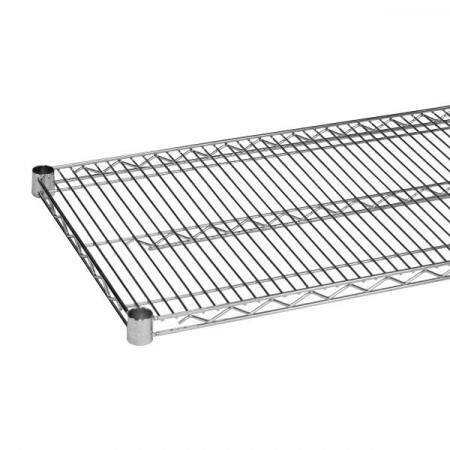 $35.99 Royal ROY S 2448 Z Polycoated Zinc Wire Shelf 24" x 48"
$63.99 Advance Tabco EG-2448 Green Epoxy Coated Wire Shelf 24" x 48"
$30.42 Winco VC-2448 Chrome Plated Wire Shelf 24" x 48"
$31.05 Winco VEX-2448 Epoxy Coated Wire Shelf 24" x 48"
Use the Thunder Group CMSV2448 Chrome Wire Shelving 24" x 48" to add a large, wide storage space to your commercial kitchen. With an open wire design, this shelving piece prevents dust from accumulating by allowing air to flow through the gaps. For outstanding durability, this NSF approved piece is made from chrome-plated metal that will withstand heavy duty use while retaining its shape. Convenient to use, this wire shelving is easy to clean and comes with plastic clips for fast installation.